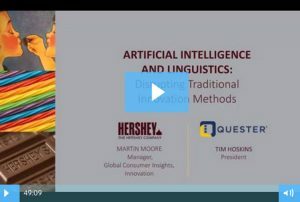 Introduction to a Greenbook webinar with Martin Moore, Consumer Insights, Innovation at Hershey’s, and Tim Hoskins, President at Quester. In this webinar, we demonstrated how product innovation is a consequence of understanding Jobs To Be Done, a framework based on Harvard research that allows marketers to deeply understand a specific situation. In this Hershey’s case study, they explained their need to better understand the job that consumers expect snacking to do, such as satisfying hunger or reducing boredom. The process involved reframing snacking not as just buying products, but rather as hiring a service to fulfill a job requirement, something that has clear criteria for hiring and firing a solution, and clear specifications for fulfillment. Part of understanding the Job To Be Done is understanding the circumstances around it. This includes understanding the people involved, what they are doing, where they are, and time of day. Thus, a busy parent preparing lunches and driving kids around might want a speedy snack that can be eaten with ease. Similarly, an active person who schedules every moment of their day might consciously plan to bring a nutritious, portable snack with them to eat later in the day. As a test, Hershey’s decided to replicate a qualitative, in-person interview study they had already completed to determine whether they could uncover the same jobs, with the same level of confidence. Rather than 16 IDIs, they conducted 200 IDIs using Quester’s AI moderation tool. In the end, numerous interesting outcomes occurred. Although the interviews were planned to take 20 to 30 minutes, people warmed up to the AI tool and ended up speaking for 30 to 40 minutes. The large increase in sample size made possible by using Quester’s AI moderation tool allowed Hershey’s to identify 3 times as many Jobs To Be Done. Letting Quester’s skilled linguistic analysts take on the heavy lifting of data synthesis and job-writing also contributed to the increased number of identified Jobs To Be Done. The larger sample size gave them more confidence that the identified Jobs To Be Done were the ones they should spend their time on. It was a cost-effective tool. Although it did cost a bit more, the cost per interview was significantly less, and they gained far more insights to test in subsequent quantitative stages. On a separate note, people enjoy the experience! According to the GRIT CPR study, only about half of participants score their research experience as Top 3 Box on a 10-point scale. However, about three-quarters of Quester participants score Top 2 Box on a 7-point scale. People like to participate in interviews on their own time and using their own words. Click here to watch the webinar and learn more!